Thanks to the six of you who already submitted brackets. The rest of you, get moving! If this has clarified your thinking, you can submit (and I suppose resubmit) your bracket until 9:15am PST or 12:15 noon EST when the first game starts. I kept telling people the wrong thing this year — I got the time zones all confused. Ooooops, sorry everyone! Also, check out the President’s bracket — he picked UNC last year, and they won. This year, it’s KU all the way. What!? 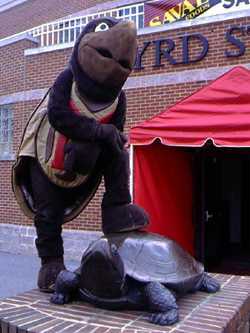 He didn’t even have the Terps going to Sweet 16. Boo. .-= Leaf´s last blog: It’s a bird! It’s a plane! =-.